The Double Lane Rock Wall obstacle challenge course features a unique modern look offering a fast, straight, two lane TWIST LANES course that will generate some of the most competitive races. Want something longer and more physically taxing? The Jumbo courses are designed to be attached creating an 80’ challenge course. The Double Lane Rock Wall obstacle challenge course features a unique modern look offering a fast, straight, two lane course that will generate some of the most competitive races. Want something longer and more physically taxing? The Jumbo courses are designed to be attached creating an 80’ challenge course. The 40 ft Obstacle course has two lanes through seven different challenges! Your guests will crawl through tunnels, jump through holes, squeeze between log jams, pinball their way through biff n bash poles, climb the 8′ ramps, and scream down a 16′ slide! Add water option and turn it into a fun waterpark. Double Lane to run Two at a Time through this WET or DRY Obstacle of FUN. 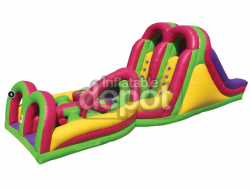 Comes complete with a two (2) piece inflatable obstacle course; they can be used as one or as two separate units. This is a great item for any event you are having anywhere and great for team building and those with a competitive spirit. The 65 ft Mega Obstacle course has 2 lanes through 7 different challenges! Your guests will crawl through tunnels, jump through holes, squeeze between log jams, pinball their way through biff n bash poles, climb up the 8′ ramps, and scream down a 16′ slide! Can something this fun be safe? Yes! There is safety screen mesh throughout the course to keep kids from hitting their heads on the ground. 7 different obstacle elements packed in one all-enclosed unit. Guaranteed fun for ALL ages. Perfect for any backyard or great at your next event. Zoom Up! Zoom Down! Zoom Upside-Down! 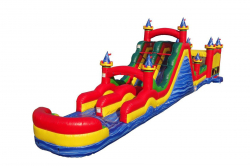 75-foot long Obstacle Bounce House with Roller Coaster Dual Lane Wet or Dry Slide. The roller coaster slide will take thrill seekers for a wild and fun ride. 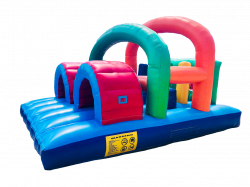 The Circus Obstacle Bounce House with Roller Coaster Dual Lane Slide offers a series of 360° physical challenging activities including jumping, running, crawling, climbing and sliding plus large bouncing area. Overcoming the obstacles and breaking barriers before enter the dual lane slide. Most Awesome Obstacle Course Around Houston & Surrounding. 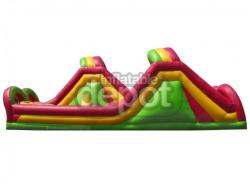 Comes complete with a two (2) piece inflatable obstacle course; they can be used as one 80' or as two separate 40' units. 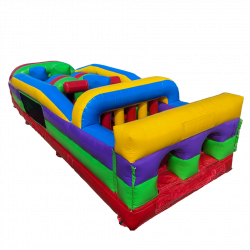 This is a great item for any event you are having anywhere and great for team building and those with a competitive spirit. 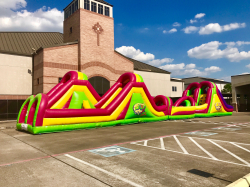 The 80 FOOT Two Lane Quadruple Rockwall Obstacle Course has 2 lanes through different challenges! Your guests will crawl through tunnels, jump through holes, squeeze between log jams, pinball their way through biff n bash poles, climb up the 16′ ramps, and scream down a 16′ slide! 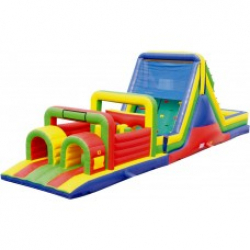 Double Tunnels, Interactives, Inflatable Beams & Pass throughs all in this mini obstacle.